ã Copyright 2004-10. L. Braile. Permission granted for reproduction and use of files and animations for non-commercial uses. 1. Introduction: Seismic wave animations are used to illustrate different types of wave propagation through elastic materials. Animations are provided to view wave propagation in a 3-dimensional solid for Compressional (P), Shear (S), Rayleigh (R) and Love (L) waves. Wave characteristics and particle motions of these wave types can be easily illustrated using the seismic wave animations. A related PowerPoint presentation for seismic waves and the slinky is available for download at: http://web.ics.purdue.edu/~braile/new/SeismicWaves.ppt. 2. Seismic Waves: The main seismic wave types are Compressional (P), Shear (S), Rayleigh (R) and Love (L) waves. P and S waves are often called body waves because they propagate outward in all directions from a source (such as an earthquake) and travel through the interior of the Earth. In the animations shown here, the P and S waves are shown propagating horizontally, parallel to the Earth’s surface. Love and Rayleigh waves are surface waves and propagate approximately parallel to the Earth’s surface. Although surface wave motion penetrates to significant depth in the Earth, these types of waves do not propagate directly through the Earth’s interior. Descriptions of wave characteristics and particle motions for the four wave types are given in Table 1.
or, as an html file at: http://web.ics.purdue.edu/~braile/edumod/slinky/slinky4.htm. Alternating compressions (“pushes”) and dilations (“pulls”) which are directed in the same direction as the wave is propagating (along the ray path); and therefore, perpendicular to the wavefront. VP ~ 5 – 7 km/s in typical Earth’s crust; >~ 8 km/s in Earth’s mantle and core; ~1.5 km/s in water; ~0.3 km/s in air. P motion travels fastest in materials, so the P-wave is the first-arriving energy on a seismogram. Generally smaller and higher frequency than the S and Surface-waves. P waves in a liquid or gas are pressure waves, including sound waves. Alternating transverse motions (perpendicular to the direction of propagation, and the ray path); commonly approximately polarized such that particle motion is in vertical or horizontal planes. ~ 2.5-3.0 km/s in (solid) inner core. S-waves do not travel through fluids, so do not exist in Earth’s outer core (inferred to be primarily liquid iron) or in air or water or molten rock (magma). S waves travel slower than P waves in a solid and, therefore, arrive after the P wave. Transverse horizontal motion, perpendicular to the direction of propagation and generally parallel to the Earth’s surface. VL ~ 2.0 - 4.4 km/s in the Earth depending on frequency of the propagating wave, and therefore the depth of penetration of the waves. In general, the Love waves travel slightly faster than the Rayleigh waves. Love waves exist because of the Earth’s surface. They are largest at the surface and decrease in amplitude with depth. Love waves are dispersive, that is, the wave velocity is dependent on frequency, generally with low frequencies propagating at higher velocity. Depth of penetration of the Love waves is also dependent on frequency, with lower frequencies penetrating to greater depth. Motion is both in the direction of propagation and perpendicular (in a vertical plane), and “phased” so that the motion is generally elliptical – either prograde or retrograde. VR ~ 2.0 - 4.2 km/s in the Earth depending on frequency of the propagating wave, and therefore the depth of penetration of the waves. Rayleigh waves are also dispersive and the amplitudes generally decrease with depth in the Earth. Appearance and particle motion are similar to water waves. Depth of penetration of the Rayleigh waves is also dependent on frequency, with lower frequencies penetrating to greater depth. 3. Seismic Wave Animations: Seismic wave animations for the P, S, Rayleigh and Love waves have been created using a 3-D grid shown in Figure 1. All wave types are designed to propagate in the X direction (illustrated in Figure 1) and parallel to the Earth’s surface. The wave animations illustrate wave characteristics and particle motion as listed in Table 1. However, no decrease in energy or amplitude with distance due to spreading out of the wave energy (geometrical spreading) or loss of amplitude caused by absorption of energy (sometimes called attenuation) by the media (due to anelasticity) are included. The elastic material is also assumed to be isotropic (velocity and other physical properties are the same for all directions of propagation), therefore, no anisotropy is included in the animations. Furthermore, for the surface wave animations, no dispersion (variation in wave velocity with frequency) has been included. The seismic wave animations were created using a Matlab code and then converted to an animated GIF format. http://paws.kettering.edu/~drussell/demos.html. Wave propagation in the Earth can also be illustrated effectively using the simulation software Seismic Waves (developed by Alan Jones of SUNY, Binghamton) available at: http://bingweb.binghamton.edu/~ajones/. Figure 1. View of 3-D grid used to illustrate seismic wave propagation. The mesh (grid) represents a volume of elastic material through which waves can propagate in the direction shown. The 3-D grid is shown in perspective view to demonstrate the wave propagation effects and particle motions of the different wave types in all directions. In the animations shown below, Compressional, Shear, Rayleigh and Love wave propagation through the elastic material is illustrated. In this 3-D volume, the grid is designed to have an upper surface (corresponding to the Earth’s surface) that consists of a boundary with a vacuum or very low density fluid above so that surface wave propagation (Rayleigh and Love waves) as well as body wave propagation (Compressional and Shear waves) can be illustrated. 4. P, S, Rayleigh and Love wave animations: Seismic wave animations (animated gifs that are viewed as html files using a browser such Internet Explorer or Netscape) can be opened by clicking on the images shown in Figures 2-5 below (use the Back or back arrow button in your browser to return to the current document). The deformation (a temporary elastic disturbance) propagates. Particle motion consists of alternating compression and dilation (extension). Particle motion is parallel to the direction of propagation (longitudinal). Material returns to its original shape after the wave passes. ã Copyright 2004-10. L. Braile. Permission granted for reproduction and use of animations for non-commercial uses. Figure 2. Click on Figure to view Compressional (P) wave animation; use the Back button to return to the current document. To better understand the particle motion and characteristics of the P wave, notice the deformation of the black rectangle as the wave propagates through it. The deformation (a temporary elastic disturbance) propagates. Particle motion consists of alternating transverse motion. Particle motion is perpendicular to the direction of propagation (transverse). The transverse particle motion shown here is vertical but can be in any direction; however the Earth’s approximately horizontal layers tend to cause mostly SV (in the vertical plane) or horizontal (SH) shear motions. Material returns to its original shape after the wave passes. Figure 3. Click on Figure to view Shear (S) wave animation; use the Back button to return to the current document. To better understand the particle motion and characteristics of the S wave, notice the deformation of the black rectangle as the wave propagates through it. The deformation (a temporary elastic disturbance) propagates. Particle motion consists of elliptical motions (generally retrograde elliptical as shown in the figure) in the vertical plane and parallel to the direction of propagation. Amplitude decreases with depth. Material returns to its original shape after the wave passes. Figure 4. Click on Figure to view Rayleigh (R) wave animation; use the Back button to return to the current document. To better understand the particle motion and characteristics of the Rayleigh wave, notice the deformation of the black rectangle as the wave propagates through it. Also, if you focus on the top edge of the end of the 3-D grid while the wave is passing through that region, the retrograde elliptical particle motion is very clearly seen. The deformation propagates. Particle motion consists of alternating transverse motions. Particle motion is horizontal and perpendicular to the direction of propagation (transverse). To best view the horizontal particle motion, focus on the Y axis (red line) as the wave propagates through it. Amplitude decreases with depth. Material returns to its original shape after the wave passes. Figure 5. Click on Figure to view Love (L) wave animation; use the Back button to return to the current document. To better understand the particle motion and characteristics of the Love wave, notice the deformation of the black rectangle as the wave propagates through it. While viewing the Love wave animation, remember that the particle motion is purely horizontal (in the plus and minus Y direction in the diagram) and perpendicular to the direction of motion (the X direction in the diagram). Although it may appear in the animation (due to the perspective view of the 3-D grid) that the top surface of the grid is moving vertically (parallel to the Z axis), the particle motion is purely horizontal. To aid in seeing that the particle motion is horizontal and perpendicular to the direction of propagation, focus on the Y axis (red line) while the wave in the animations is propagating through the grid. Download Seismic Wave Animated gif file as individual html files: After opening the animated gifs as html files by clicking on one of the figures (Figures 2-5) above, open the File menu and select the Save As option and save the animation as an html file. 6. Seismic Waves on Seismograms and Particle Motion Diagrams: The wave motion for actual earthquake motions, as recorded on 3-component seismograms, can be compared with the theoretical wave motion for the various wave types that are illustrated in the seismic wave animations shown above. Earthquake seismograms were examined for an M6.5 earthquake near the west coast of Chile that was recorded at station NNA (Nana, Peru). The epicenter and station location and historical seismicity are shown in the map in Figure 6. Seismic waves are commonly recorded on 3-component seismographs that record ground motion in the vertical and two horizontal directions. An example is shown in Figure 7. P-, S- and surface-wave arrivals are visible. The approximate propagation path (ray path) that the first arriving P- and S-waves travel though the upper part of the mantle is shown in Figure 8. 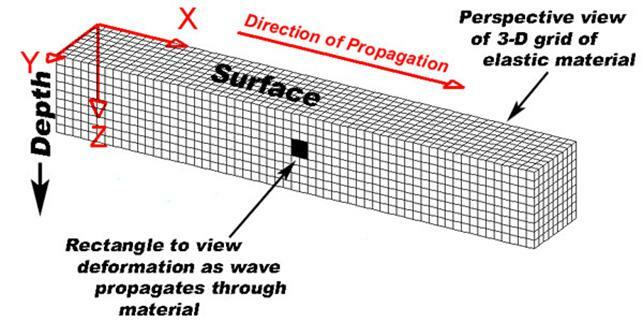 Surface waves propagate from the earthquake to the seismograph station along the Earth’s surface but with wave motion that penetrates to significant depth below the surface as illustrated in the Rayleigh and Love wave animations described above. Figure 6. Location map and historical seismicity in west central South America. Earthquake epicenter (red star) and NNA seismograph station (red triangle). 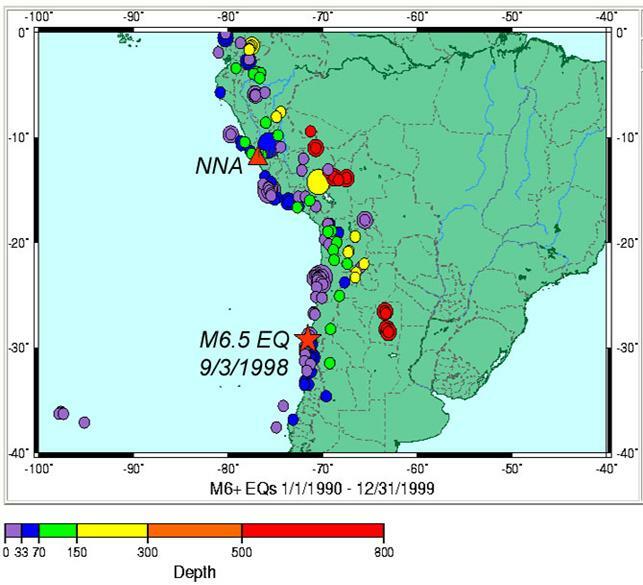 Earthquake epicenters for events of magnitude 6 and greater for the period January 1, 1990 to December 31, 1999 are shown by the colored dots which are color-coded by depth of the earthquake. Figure 7. Seismograms recorded by a 3-component seismograph at Nana, Peru for an earthquake located near the coast of central Chile on September 3, 1998. The three seismograms record motion in horizontal (east-west and north-south) and vertical (Z) directions. P, S, Rayleigh and Love waves are identified on the record. The S wave arrives significantly after the P-wave because S-wave velocity in rocks is lower than P wave velocity. Additional arrivals between the P and the S wave are P and S waves that have traveled more complicated paths (such as the pP and PP phases and P-to-S converted phases) from the earthquake location to the seismograph. The surface waves arrive after the S waves because surface wave velocities in rocks are lower than the shear wave velocity. The surface waves extend over a long time interval because surface wave propagation is dispersive (the velocity of propagation is dependent on the frequency of the wave). This dispersive character can easily be seen in the Rayleigh wave on the vertical (Z) component seismogram in that the earliest Rayleigh wave energy has a longer period (lower frequency) than the later arriving waves. The seismic data that are displayed here were acquired from the IRIS website (www.iris.edu) using the WILBER II program from the IRIS Data Management Center. Figure 8. Partial cross section of the Earth showing major layer boundaries, approximate P-wave seismic velocities (Vp), and approximate ray path for P- and S-waves from a shallow earthquake to a seismograph at about 18 degrees (~2000 km) distance. The seismograms in Figure 7 can also be shown as particle motion plots (two dimensional plots of the ground motion illustrating the motion in one plane) for specific phases (short segments of the records) as illustrated in Figure 9 for the seismograms in Figure 7. A 3-D perspective plot of the P-wave particle motion is also shown in Figure 10. For example, one can observe that the first motion of the P wave was down and to the south (see the Z and NS seismograms in Figure 7 and the upper left particle motion diagram in Figure 9). 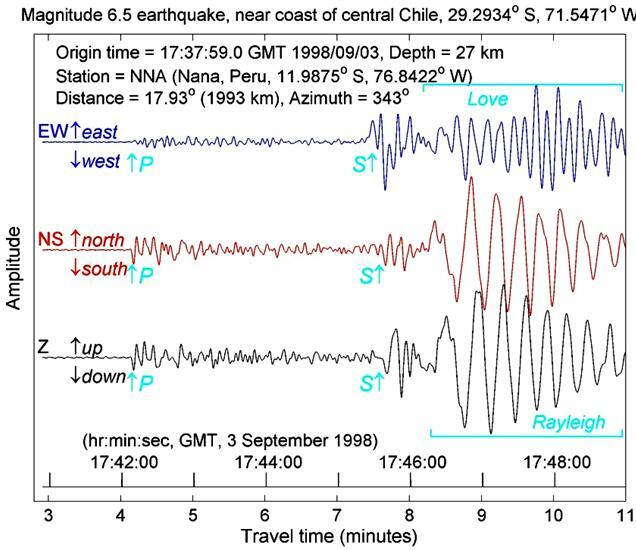 Note that the wave was traveling approximately from south to north from the epicenter to the NNA seismograph station (Figure 6). So, the Z-NS particle motion diagram (upper left hand corner of Figure 9) shows that the P-wave arrival (a longitudinal wave as illustrated in the animations described above) is arriving at an angle and from the south and the motion is down to the south and then up to the north (along the direction of the ray path which is diagonally from the lower left hand corner of the diagram). The EW-NS particle motion diagram (upper right diagram in Figure 9) shows the horizontal motion of the first arriving P wave and confirms that the motion is in the north-south direction with the first motion (small numbers on the particle motion line) to the south. The first shear wave motion (illustrated in the particle motion diagram in the lower left of Figure 9) is arriving from down and to the south (diagonally from the lower left in the particle motion diagram). Although the shear wave motion is more complicated than the P-wave motion, the particle motion diagram shows that the motion is generally perpendicular to the direction of propagation, as expected from theory. The Rayleigh wave particle motion plot is shown in the Z-NS plane in the diagram in the lower right of Figure 9. The Rayleigh wave from the earthquake propagated horizontally and almost directly from the south (from the left in the particle motion diagram in Figure 9). Following the numbers (which are spaced at 10 seconds apart on the seismogram), beginning with the number one, on the particle motion diagram, one can see that the Rayleigh wave particle motion is approximately retrograde elliptical (consistent with theory and the Rayleigh wave animation described above) and that a complete cycle is defined in about 20 seconds (note that the 4 and 6 labels and the 5 and 7 labels are nearly at the same location. One can also observe on the Z and NS seismograms (Figure 7) that the Rayleigh wave energy, in the area of the seismogram corresponding to the maximum amplitudes, is of approximately 20 s period. Figure 9. Particle motion diagrams for selected seismic waves from the seismograms shown in Figure 7. Plots illustrate the particle motion by plotting seismograms for two components of motion, one component on the horizontal axis and one component on the vertical axis (two horizontal components for the diagram in the upper right). The relative amplitude of ground motion in each direction is indicated by the axis labels. Numbered circles on the particle motion plots show successive times (every 1 second beginning at 17:42:07 UTC/GMT time for the P wave particle motion plots – 8 s record; every 2 seconds beginning at 17:45:33 UTC/GMT time for the S wave particle motion plot – 26 s record; and every 10 seconds beginning at 17:46:30 UTC/GMT time for the Rayleigh wave particle motion plots – 100 s record). 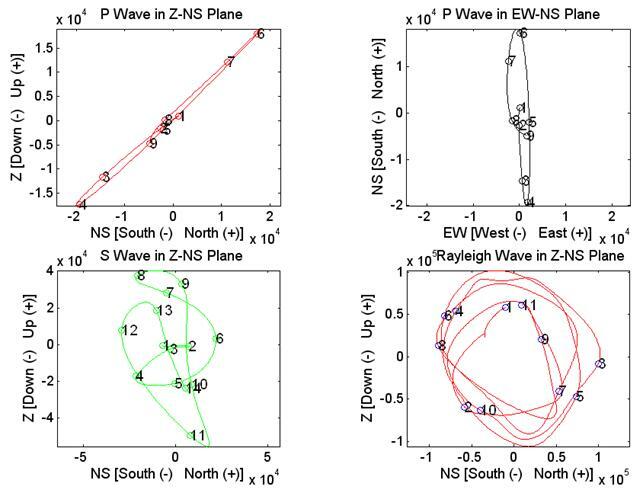 P-wave particle motion is shown for the Z-NS plane (upper left graph) and for the EW-NS plane (upper right graph. S-wave particle motion is shown for the Z-NS plane in the graph at the lower left. Rayleigh-wave particle motion is shown for the Z-NS plane in the graph at the lower right. Because the Love wave motion is purely horizontal and the NNA station is almost directly north of the epicenter, the particle motion on the east-west component seismogram after about 17:46:20 (Figure 7) is almost completely Love wave energy. Finally, a 3-D view of the P wave particle motion is illustrated in Figure 10. The bold arrow shows that approximate direction of approach of the P wave energy at the NNA seismograph, corresponding to a ray path coming up and from the south (similar to the ray path shown in Figure 8). Figure 10. Particle motion diagram for the P wave from the seismograms shown in Figure 7. Three-D perspective plot illustrates the particle motion by plotting seismograms for three components of motion, two components on the horizontal axes and one component on the vertical axis. The relative amplitude of ground motion in each direction is indicated by the axis labels. Numbered circles on the particle motion plot show successive times (every 1 second beginning at 17:42:07 UTC/GMT time for the P wave particle motion – 8 s record). The bold arrow shows the approximate direction (ray path) of the P wave energy arriving at the seismograph station. 7. Teaching Strategies: We provide the following suggestions and activities for using the seismic wave animations and other materials in this document for educational purposes. http://web.ics.purdue.edu/~braile/edumod/slinky/slinky4.doc). The slinky demonstrations can be used to reinforce and extend the understanding of seismic wave types and seismic wave propagation and provide hands-on, discovery experiences with waves. 2. The seismic wave animations can be used to introduce the four seismic wave types and the particle motion characteristics of the wave types. View the wave animations several times and review the characteristics of each wave type. (The html version of the seismic waves demonstrations and animations or the PowerPoint presentation – see downloads above – are convenient methods for viewing and discussing the demonstrations and animations.) Focusing on one area of the 3-D grid such as the black rectangle or the top edge at the end of the grid is an effective method for observing the particle motion characteristics. Use the un-labeled seismic wave types diagrams (Figure 11) to quiz the class on recognizing the characteristics of the waves and particle motions. What seismic wave type is shown here? 3. The second half of the seismic wave animations document (this document, section 6) compares the seismic wave animations with actual seismograms, seismic waves from an earthquake source, and particle motion diagrams derived from the 3-component seismograms. Although the details of the seismograms and the particle motion diagrams are complicated and visualization of the 3-D nature of the wave motion is somewhat difficult, the primary objective of this section is to show that real seismic waves are consistent with the theoretical features of the wave animations. Depending on the experience level of your audience and the amount of time that you wish to devote to study of seismic waves, use of the seismogram and particle motion material may be limited. http://web.ics.purdue.edu/~braile/edumod/as1lessons/UsingAmaSeis/UsingAmaSeis.htm (see sections 3.8 and 5.4). a. Single wave type demonstration: For each wave type, have one or more students perform the propagation and particle motion simulation. Do the simulation for one wave type at a time. Compare the simulation with the seismic wave animations. Follow up by having one or more students perform one of the wave type simulations without announcing to the class which wave type was selected. While the students are demonstrating the wave type, ask students in the class to identify the seismic wave and the properties that characterize it. What characteristics of the wave cannot be represented by the simulation (compare with the animations and the properties listed in Table 1)? b. Waves in all directions demonstration: Have 4-6 students with the circular pieces stand in the center of a room facing outward in different directions. At your signal, have the students walk away from the central location (in all directions) and perform one of the wave simulations. Do the simulation for one wave type at a time. This activity demonstrates that the various wave types propagate from a source location (such as the focus of an earthquake) in all directions (the surface waves always propagate approximately parallel to the Earth’s surface). What characteristics of wave propagation cannot be represented by the simulation (compare with the animations and the properties listed in Table 1)? c. Four wave types propagating at once demonstration: Have four students with circular pieces stand in a line at one side of the room facing away from the wall. At your signal, the students all walk forward performing a wave motion simulation. The first student walks fast and demonstrates the P-wave motion. The second student walks at a medium speed and demonstrates the S-wave motion. The last two students walk slowly and one demonstrates the Rayleigh wave motion and the other demonstrates the Love wave motion. This activity shows that all four wave types propagate, and that they travel at different speeds and have relatively distinct motion. What characteristics of wave propagation cannot be represented by the simulation (compare with the animations and the properties listed in Table 1)? With twelve or sixteen students, one can simulate the four wave types and different speeds and have the waves also propagate in different directions at the same time illustrating wave energy spreading out from a source. In association with the seismic wave animations, the use of the slinky demonstrations, and other information and demonstrations related to waves, these activities can be effective tools for enhancing learning. The activities, particularly the simulations, allow hands-on experience and concrete modeling of wave phenomena that can improve understanding, reinforce fundamental concepts and theory, generate interest, and allow student discovery. Figure 12. Schematic diagram illustrating students performing wave simulations. Student holds a poster board or cardboard circle in front of his or her body and walks forward (like the seismic waves propagating in the Earth). While walking, the student moves their circle forward and backward (“push and pull”, for the P wave), or up and down (transverse motion for the shear wave), or in a retrograde ellipse (for the Rayleigh wave), or side to side horizontally (for the Love wave), as shown above. 8. Connections to National Science Education Standards (National Research Council, 1996): Seismic waves, wave propagation in the Earth and energy carried by seismic waves are related to the following science standards: Content Standards: Science as Inquiry – practice inquiry and fundamental science skills (grades 5-8 and 9-12, A); Physical Science – properties of matter, motion, transfer of energy (grades 5-8, B), structure of matter, motion, interactions of energy and matter (grades 9-12, B); Earth and Space Science – relate to energy in the Earth system (grades 9-12, D). Bolt, B.A., Earthquakes, (5th edition; similar diagrams are included in earlier editions of Earthquakes), W.H. Freeman & Company, New York, 378 pp., 2004. Encyclopedia Britannica, CD, Deluxe Edition, http://www.britannica.com/, 2003. National Research Council, National Science Education Standards, National Academy of Sciences, Washington, D.C., 262 pp., http://www.nap.edu/readingroom/books/nses/, 1996. 10. Acknowledgements: Thanks to George Jiracek for suggesting the addition of the black rectangle on the seismic wave animation diagrams for better recognition of particle motion, and to Sheryl Braile for suggesting the hands-on seismic wave simulation activity described in activity number 6 in the Teaching Strategies section (section 7). Partial funding for this development provided by the National Science Foundation.